...But Before You Start, know this. Fractions represent portions of numbers, sometimes smaller and sometimes larger. When applying operations to fractions, there are a number of steps to follow. 1. Proper Fraction: the top number is less than the bottom number and the value of the fraction is between 0 and 1. 2. Improper Fraction: the top number is more than the bottom number, and the value of the fraction is more than 1. 3. Equivalent (or Proportional) Fractions: two fractions that have the same value when simplified but have different numbers. The second fraction is a multiple of the first, which makes them proportional and equivalent. 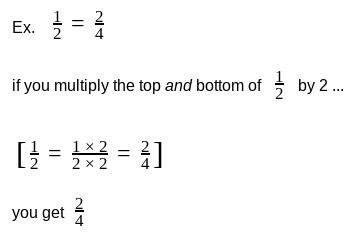 If you multiply the top and bottom by the same number you get a new fraction that is equivalent to the original. How can you prove they're equivalent??? When you convert both from fraction to decimal by dividing, you’ll get the same decimal for both fractions.